After about 6 months some babies get their first teeth. They can also move their tongue and their entire mouth better. From the 8th month it is time to get them used to their first small chunks in food. Early morning: First thing in the morning, milk is still the best meal. Breastfeed your baby or prepare some HiPP 2 Follow-on Milk. Follow-on milk is adapted to the requirements of older babies. From the 8th month your baby can learn to drink milk out of a cup. That promotes development and is better for the teeth. Later morning: During the later morning you can continue to breastfeed or give HiPP Milk Formula. 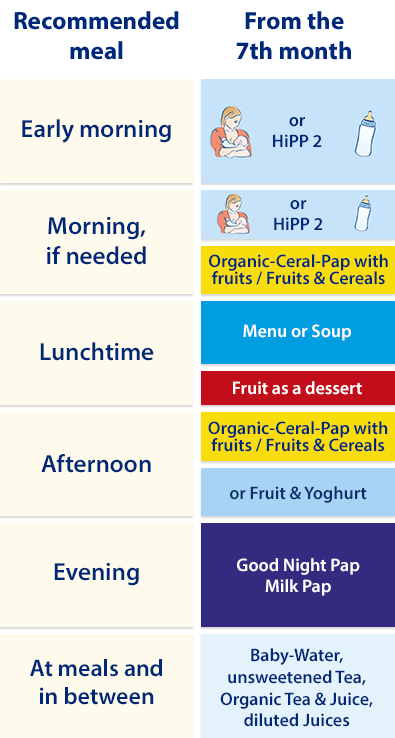 If your baby is very hungry, you can offer some HiPP Fruit & Cereal in addition. These meals are easily digested and, due to the cereal, also filling. Lunchtime: From the 8th month you can offer your baby our menus for from 8 months. These contain tender, small pieces in order to encourage your baby to chew. Learning to chew is important for development and for learning to speak. The portions are larger for this age group, as your baby now needs more to become full. From the 7th month there is more choice for snacks. You can now also offer your baby HiPP Fruit & Yoghurt or HiPP Fruit Duet – fruit with yoghurt or curd cream. For first nibbles from the 8th month, there are a variety of HiPP snack articles such as HiPP Baby Biscuit, HiPP Baby Rusk, HiPP Children’s Millet Curls or HiPP Rice Cakes as ideal complements for in between meals. In the evening: You will also find new varieties of HiPP Good Night with no added sugar in a jar or milk paps to mix, which have a slightly coarser structure, as well as several new flavours from the 8th month. Drinks: With the third weaning meal at the latest, something to drink should be offered at every meal. Baby water or diluted fruit juices are the most suitable. My baby does not yet have any teeth. Can he/she still eat meals with solid bits? Yes, because the bits are so small that babies can squash them just by using their jaw. My baby does not like the coarser food yet. What can I do? Continue to feed finely puréed menus and gradually add more and more of the menus from the 8th month. How large should one portion be? Our jars from the 8th month come in age-appropriate portions that are eaten up by most children. However, there are also children who eat slightly more or who are satisfied with less. It is absolutely normal that your baby’s appetite will show certain fluctuations. If your baby is very hungry, offer fruit as a dessert.